SocialLearning.com® is now the sole distributor of MICROLIFE publications. MICROLIFE was founded by Marian and Bob Latzko. Marian Latzko was a teacher and writer who dedicated her life to helping young people learn life skills. She wrote the popular "I Can Do It! A Micropedia of Living on Your Own," along with a companion workbook and related booklets. Bob managed the publishing house after Marian's 2006 passing until his retirement this spring. I Can Do It! A Micropedia of Living on Your Own . This quick, comprehensive mini-encyclopedia gives information that helps young people learn how to manage everyday life. I Can Do It! A Micropedia of Living on Your Own Learning Activities . Provides hands-on learning activities for leaders and teachers to use with groups of teens preparing for independent living. I'm Getting Ready ... I Can Do It (workbooks)/Set of 10 . Includes hands-on activities that help youth learn budgeting, banking, savings, credit, insurance, housing, food, furnishings, networking, cleaning, shopping, much more. Parties That Teach Independent Living Skills/Set of 10 . Actively engage teens in learning life skills through the parties mapped out in this book. Provides detailed instructions for 10 parties, 90- to 120-minutes each. Manage Your Resources to Manage Your Future/Set of 10 . Money management and self-care are the focus of the hands-on independent living learning activities in this book. Students in many types of settings will learn and apply skills they'll need to succeed on their own. See Shipping & Returns for details. Whether you're raising foster, adopted or birth children, this parenting approach will give you the tools and the techniques to help change a child's undesirable behavior. The practical handbook describes in detail what you need to know; the DVD offers the opportunity to practice what you've learned. Discover how disruptive behavior can be changed, whatever a child's age. Recognize 'acting out' and 'hidden' behaviors and know how to respond to both. Understand the nature of positive, effective discipline and how to apply it using encouragement, behavior contracts, time out, setting limits and removing privileges. Practice using these tools by working with a DVD portraying realistic family situations. Know when to call for help and where to get help. Experience cooperation in the home -- and enjoy being parents.. 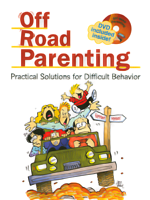 The situations presented in Off Road Parenting are as close as you can get to real-life parenting situations. After viewing the real-life family stories on DVD, you can direct those stories yourself and evaluate what happens --a valuable tool offering the benefit of advance experience. In addition, stories relating to specific age groups may be selected for review. Do you know the difference between "acting out" behavior and "hidden" behavior? If you don't, this course will enlighten you. Do you send the right messages with your current methods of discipline? This course will explain differences in discipline and show you why discipline, done effectively in a positive home atmosphere, really works. Our program stresses that disruptive behavior, be it acted out or hidden, can be changed -- whatever a child's age. Cartoons from the "Stone Soup" group -- a highly "off-road" family -- were chosen to be part of the Off Road Parenting book as they express with laughter the surprises, angst, anger and love that are part of real families everywhere. Parenting can be like driving off-road in that parents often find themselves faced with unexpected, often alarming situations. Take heart. This unique book and DVD combo enlightens and reassures that parents, like off-road drivers, can call upon experience, tools and technique and get back on track. Book:128 pages, DVD Running Time: Approximately 45 minutes. The time is determined by the path chosen as a parent works their way through the menus. View Northwest Media's research study on Off Road Parenting. "The teenage human body comes with no warranties. The owner is fully responsible for all repairs, parts and service. To ensure that you will enjoy many years of trouble-free operation, we have developed this 'Operator's Manual.' It is full of valuable information on how to maintain your body. Please read it carefully. Keep it in a safe place for future reference." 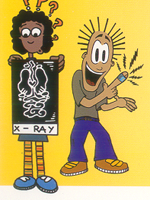 The Teenage Human Body Operator's Manual presents basic health information to teenagers in an entertaining and intriguing way. The authors have cleverly used the format of a car owner's manual to communicate brief, but important facts about topics like regular health care, personal hygiene, pregnancy prevention, protection against diseases, tattoos, and more. Filled with simple-to-read language and tons of fun cartoons, this book shows teens how to effectively deal with their everyday physical and emotional well-being, and how to understand and change personal habits.